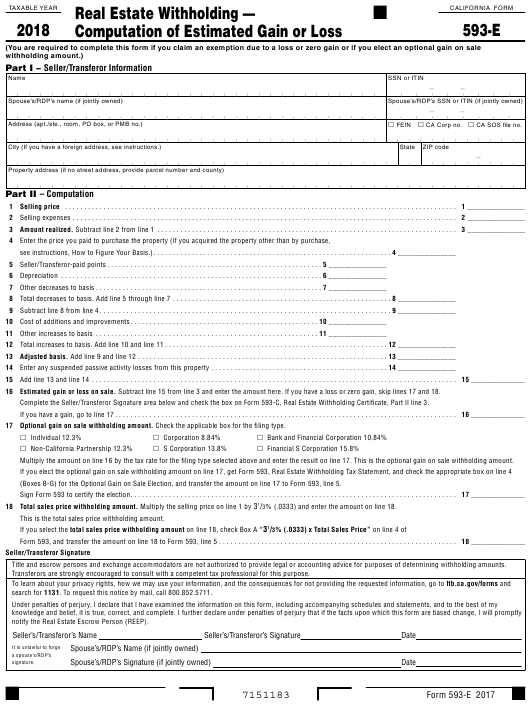 Form 593-E is a California Franchise Tax Board - issued form also known as the "Real Estate Withholding - Computation Of Estimated Gain Or Loss". A PDF of the latest Form 593-E can be downloaded below or found on the California Franchise Tax Board Forms and Publications website. 16 Estimated gain or loss on sale. Subtract line 15 from line 3 and enter the amount here . If you have a loss or zero gain, skip lines 17 and 18 . Complete the Seller/Transferor Signature area below and check the box on Form 593-C, Real Estate Withholding Certificate, Part II line 3 . 17 Optional gain on sale withholding amount. Check the applicable box for the filing type . Multiply the amount on line 16 by the tax rate for the filing type selected above and enter the result on line 17 . This is the optional gain on sale withholding amount . (Boxes B-G) for the Optional Gain on Sale Election, and transfer the amount on line 17 to Form 593, line 5 . % ( .0333) and enter the amount on line 18 . This is the total sales price withholding amount . Title and escrow persons and exchange accommodators are not authorized to provide legal or accounting advice for purposes of determining withholding amounts . Transferors are strongly encouraged to consult with a competent tax professional for this purpose . search for 1131 . To request this notice by mail, call 800 .852 .5711 .
notify the Real Estate Escrow Person (REEP) .